The word inspired has a second definition of breathing in. I wanted to share this infographic with you because, like the air that we breathe in to stay alive, there are a number of things we can do that will enhance and extend our lives. Some of them are simple and obvious; some aren’t. I think one of the problems with seeking good health and longevity is that we over complicate it. All we need to do is make sure that we eat intelligently, get regular exercise, get enough sleep and stay positively involved. Regular readers know how much I value the benefits of exercise. So, I was very happy to stumble upon this infographic on fresh benefits of exercise. Please check out my Page – Important facts about your brain (and exercise benefits) to read further. Some really positive and productive ideas here. I like number one about doing things for others. I have written about Random acts of kindness previously. There is also Anatomy of an act of kindness. Of course, I love number three – Exercise. It is always a key element in health – mental or physical. These sound like some good positive observations. There are some simple and very useful ideas here. I wrote about ocytocin here: What is the value of hugging? 1. The Big “O” – Oxytocin: This is the hormone of trust and “love.” It is a natural calming and feel good chemical. It connects and bonds people together and when released will evoke feelings of contentment, reductions in anxiety, and feelings of calmness and security. 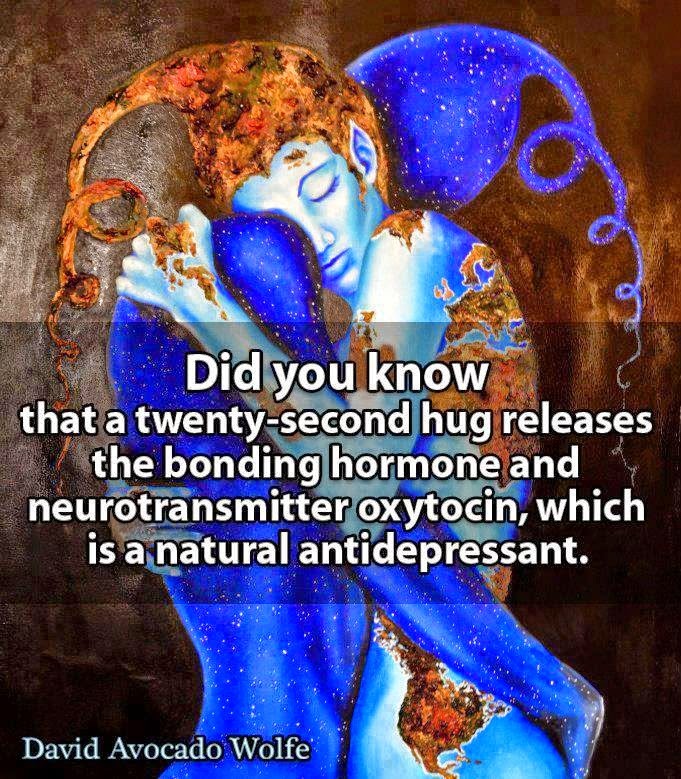 Simply touching, hugging, and interacting with loved ones can release Oxytocin and enhance intimacy. 2. Get Moving and Exercise: A proven way to enhance mood is to stay active and exercise. We have to move to be happy. Even a brisk walk can do wonders for our outlook and daily mood. When adults have around 30 minutes of moderately intense physical activity per day it has been shown to be an important factor in not only physical health, but psychological well-being as well. I think the link between gratitude and our own happiness escapes us most of the time. Lots of good ideas here. I think happiness and good health go hand in hand. Tell the truth, avoid narcissists, and stay focused on the future. We all want to be happy. Our search leads us to seek advice from mental health professionals, clergy, best-selling authors, and Buddhist monks. But despite the wealth of available information, two constants remain: One, there is no recipe for happiness. We’re all unique with different biology, childhoods, life experiences, and support systems. Two, happiness is a habit—and that’s good news, because you can choose to be happier. To make your happiness journey more attainable, here are 10 common themes that researchers have found which lead to happiness. 1. Don’t expect happiness to come with a user’s manual.